OrthAlign, Inc., a privately held U.S.-based medical device and technology company providing orthopedic surgeons with advanced precision technologies, announced today the first set of KneeAlign® cases completed for total knee arthroplasty (TKA) in Greece. 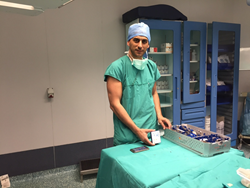 These cases were completed by Athens-based orthopaedic surgeon Spyridon Armpis, MD, MSc and continue to reflect the rapid adoption of OrthAlign's handheld precision alignment and positioning technologies, by surgeons throughout the world. "The technology not only gives me confidence in my cuts, but allows me to elevate my standard of care for patients," said Dr. Spyridon Armpis of Athens, Greece. OrthAlign provides highly accurate, computer-assisted, handheld technologies for surgeons to receive real-time, actionable data for precise alignment and positioning of components in total knee, unicondylar knee, and total hip (both posterior and anterior) arthroplasty surgeries. Over 15 peer-reviewed clinical studies have been published to date, validating OrthAlign's accuracy, simplicity of use, and benefits in recovery for the patient. "The accuracy and simplicity of KneeAlign surprised me," said Dr. Armpis. "The technology not only gives me confidence in my cuts, but allows me to elevate my standard of care for patients. I no longer have to invade the intramedullary canal, I don't have to make multiple cuts, and it makes me, my OR staff, and the recovery process for my patients more efficient. Going forward, KneeAlign will be a key part of my practice and my patient-tailored recovery program, as I am convinced it will give my patients the best possible outcomes." In a published TKA clinical study by Denis Nam, M.D. (Rush University Medical Center, Chicago, IL), significant differences favoring the use of KneeAlign vs. conventional Computer Assisted Surgery were found with regard to the accuracy of femoral component alignment, with 94.9% of patients in the KneeAlign cohort having an alignment within 2° of neutral vs. 92.5% in the CAS cohort. There was also a significant difference in overall mean mechanical alignment of the limb, with 92.5% of patients within 3° of neutral mechanical axis in the KneeAlign cohort vs. 86.3% in the CAS cohort. In another study by Dr. Nam (conducted as a randomized controlled trial, consisting of five different surgeons), it was found that KneeAlign decreases the incidence of outliers for tibial component alignment in both the coronal and sagittal planes, and improves the surgeon’s ability to achieve a specific, intraoperative goal, compared to conventional, tibial extramedullary (EM) alignment guides in TKA. In the KneeAlign cohort, 95.7% of tibial components were within 2° of perpendicular to the tibial mechanical axis and 95% of tibial components were within 2° of a 3° posterior slope (compared to 68.1% and 72.1% in the EM cohort, respectively). OrthAlign is a privately held medical device and technology company, developing advanced technologies that deliver healthier and more pain-free lifestyles to joint replacement patients, globally. We provide healthcare professionals with cutting edge, computer-assisted surgical tools that seamlessly and cost-effectively deliver vital data and clinical results to optimize outcomes for our patients. For more information regarding OrthAlign, please visit http://www.orthalign.com.